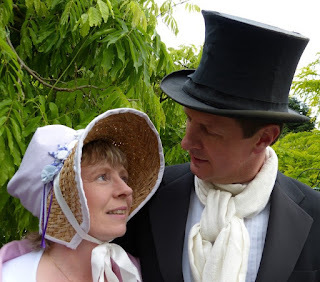 Why did Regency lovers elope to Gretna Green? 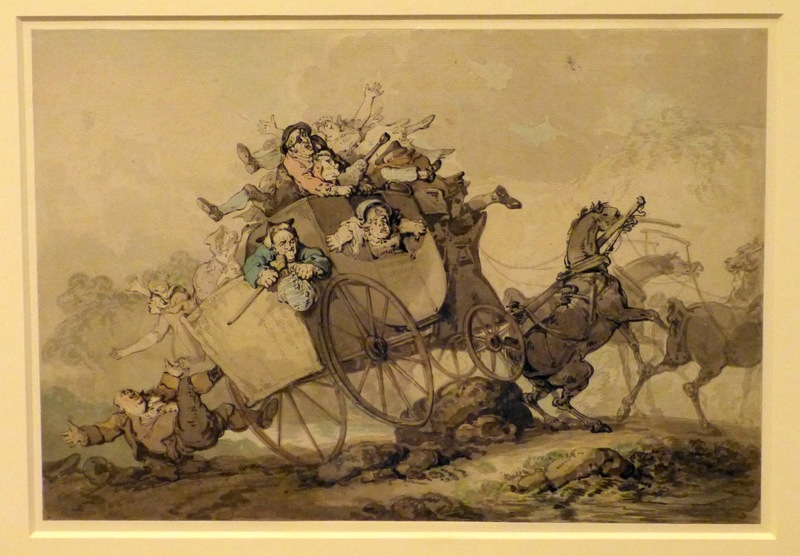 If you’ve read many Regency romances, then you are probably familiar with the notion of couples eloping to Gretna Green. But why did couples need to go all the way to Scotland to get married? 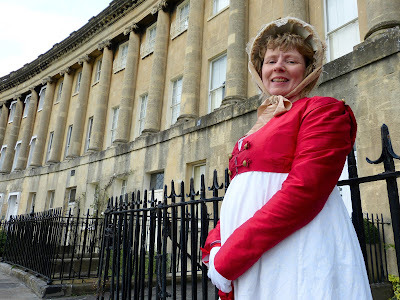 It all started with Hardwicke’s Marriage Act of 1753. Before this Act came into force, although most people were married in church and subject to the rules laid down by the Church of England, this was not legally necessary. 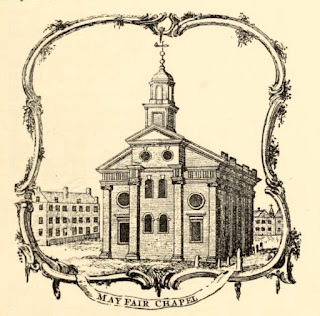 According to the Church’s rules, marriages had to take place in the church of the parish where one or both people getting married were living. Either banns had to be read—that is, the intention to marry had to be publicly announced in the church prior to the wedding—or the couple had to procure a license to marry. However, as long as the marriage was conducted by an Anglican clergyman, it was still legal, even if all the other conditions were not met! As a result, there was a roaring trade in irregular marriages, particularly at the Fleet Prison in London, where imprisoned clergymen were happy to marry couples at any time of day or night, provided the price was right. Another popular, but not quite so disreputable location, was St George’s Chapel, Hyde Park Corner, which seems to have been built for the express purpose of conducting irregular marriages. 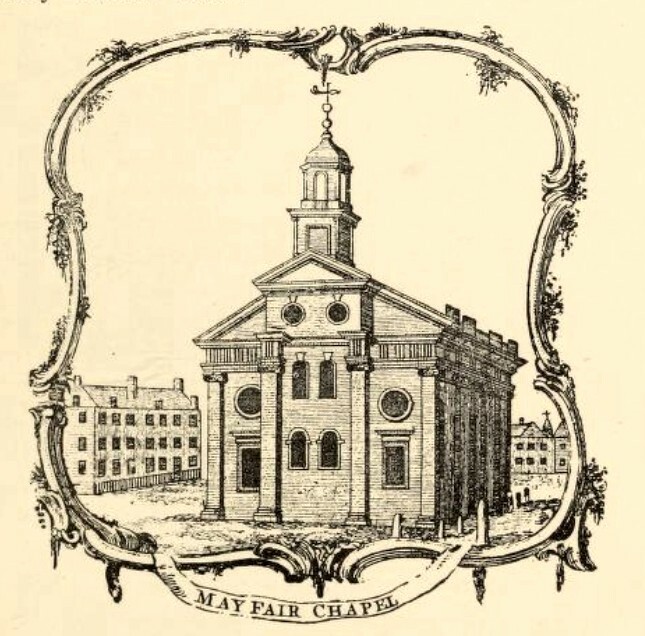 According to the marriage register of St George’s Chapel, an incredible 61 couples were married on 24 March 1754, eager to escape the restrictions that would be imposed by Hardwicke’s Act which came into force the following day (1). 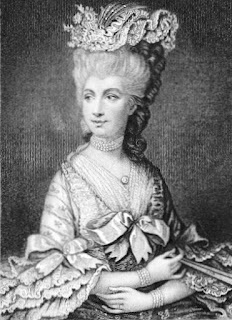 Hardwicke’s Marriage Act was devised to put a stop to these irregular marriages. • All marriages had to take place in the parish church of one of the parties getting married and be performed by the minister of that church. • All marriages had to take place in a public ceremony. • All marriages had to take place during daylight hours. • Anyone under the age of 21 wanting to get married had to have parental consent. Formal consent had to be given before a marriage license could be issued and an objecting parent had the right to forbid the banns. However, if the banns were read without challenge, it did not make the marriage illegal even if the parents were against the marriage. 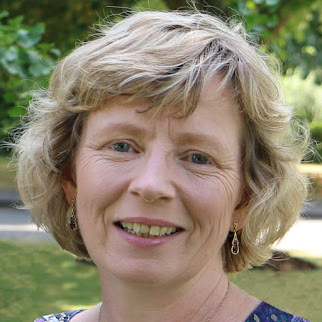 • Marriages could only take place after giving three weeks’ notice of the intention to marry, that is, the banns being read in the parish church for three times before the wedding took place. Marriages without banns required a marriage license. This was more expensive and could only be acquired from a bishop or archbishop. These rules made it virtually impossible for those under 21 to be married without their parents’ permission. 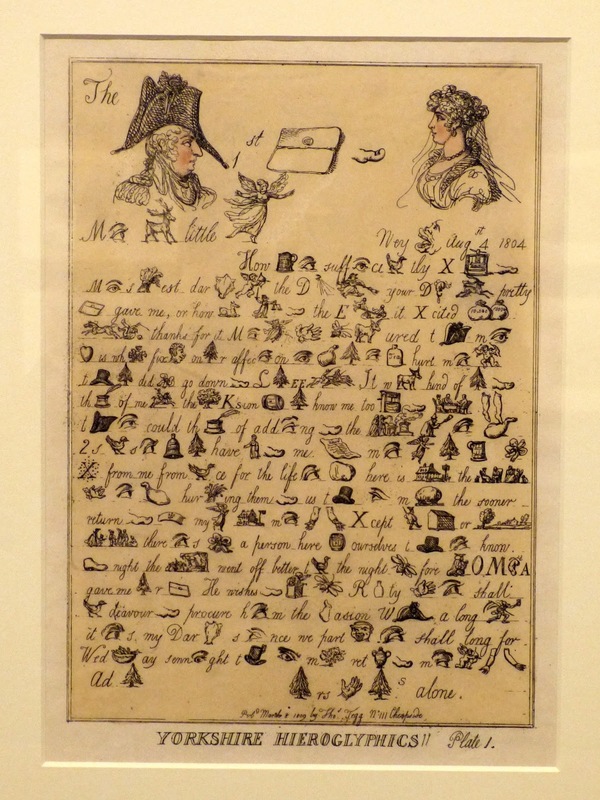 But crucially for the Gretna Green story, Hardwicke’s Marriage Act only applied in England and Wales. It did not apply in Scotland. The Scottish government was encouraged to adopt the same law, but it did not. A new trade developed along the Scottish border providing swift marriages for couples eloping from England. The most famous location for these runaway marriages was the blacksmith’s shop at Gretna Green, but other popular places in the Scottish Borders included the toll house on the Scottish side of Coldstream Bridge and the toll house at Lamberton. 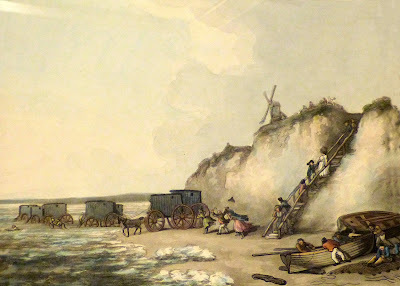 Graitney, more familiarly known as Gretna, was the first village in Scotland on the main post road from London. The blacksmith’s shop was ideally located as one of the first buildings that an eloping couple came to. All that was required for a marriage in Scotland to be legal was a declaration in front of witnesses. 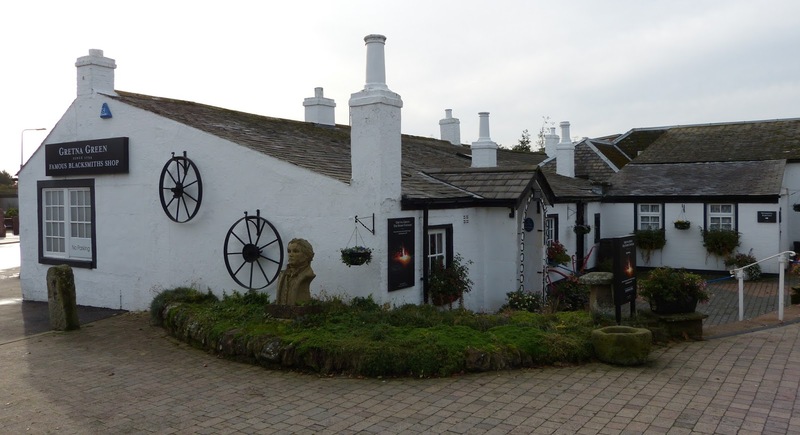 Couples arriving at the blacksmith’s shop in Gretna Green were married by a self-appointed ‘anvil priest’ – not a clergyman, but an entrepreneur who could see that conducting runaway marriages was big business. As the eloping couples were typically rich and in a great hurry to be married, the anvil priest could charge whatever he liked and the couple would probably pay. The anvil priest conducted a short hand-holding ceremony over the anvil in front of two witnesses and pronounced the couple man and wife. If the couple had arrived without witnesses, the anvil priest would obligingly provide them. One of the most famous marriages to take place at Gretna Green was between Sarah Anne Child and John Fane, 10th Earl of Westmorland, which took place on 20 May 1782. Sarah Anne’s father, Robert Child, chased the couple all the way to Scotland, but failed to prevent the marriage. He was so angry that he cut his daughter out of his will, determined that no Earl of Westmorland should benefit from his wealth. As a result, his fortune passed to his eldest granddaughter, Sarah Child Villiers, Countess of Jersey. (1) The Gretna Green website states that Hardwicke's Marriage Act came into force a day later, on 26 March 1754. 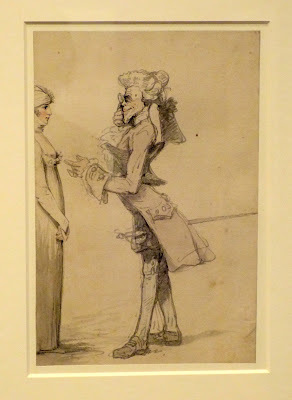 Thomas Rowlandson (1756-1827) was one of the greatest caricaturists of his time. 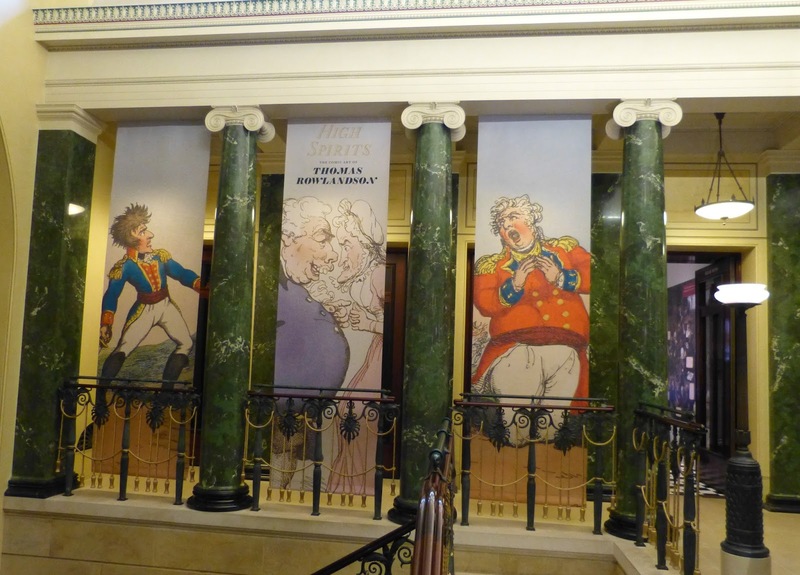 The new exhibition at the Queen’s Gallery – High Spirits – is all about his comic art and includes nearly 100 of his prints and drawings. 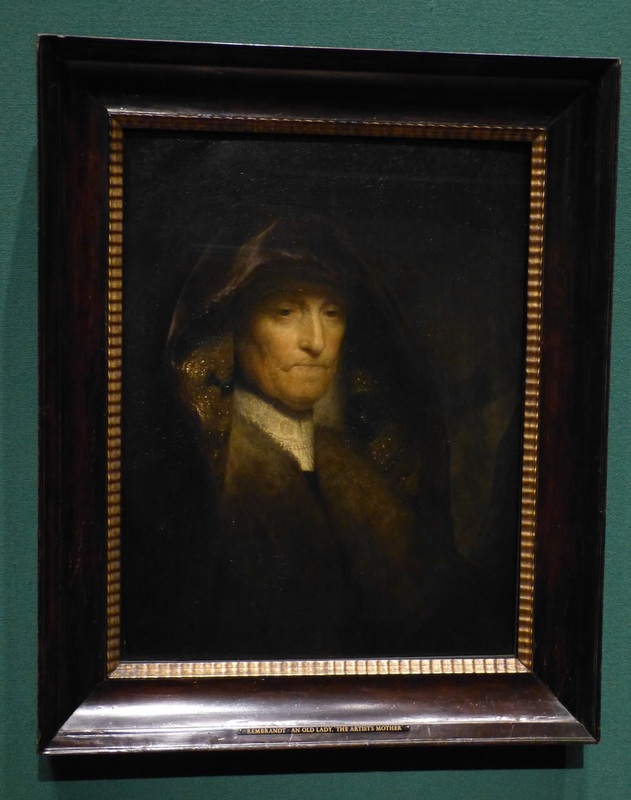 Alongside this is a display of Dutch paintings – Masters of the Everyday. Both exhibitions run until 14 February 2016. 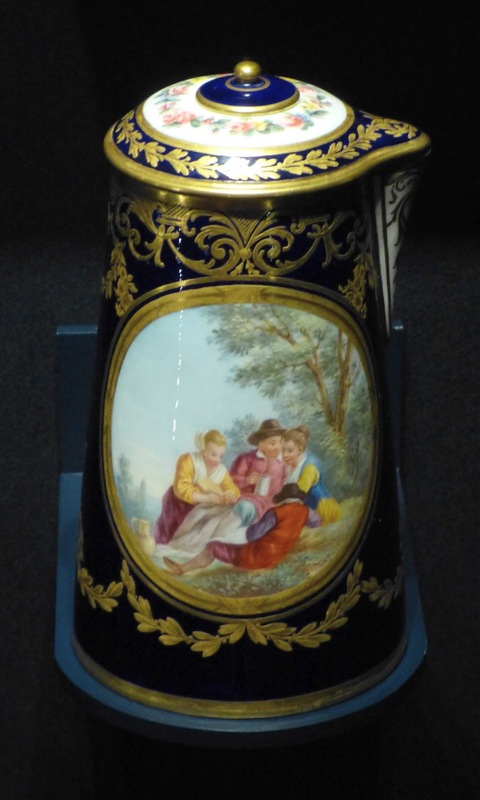 More information about visiting on the Royal Collection website. Here is the promotional video for the exhibition narrated by Brian Blessed. 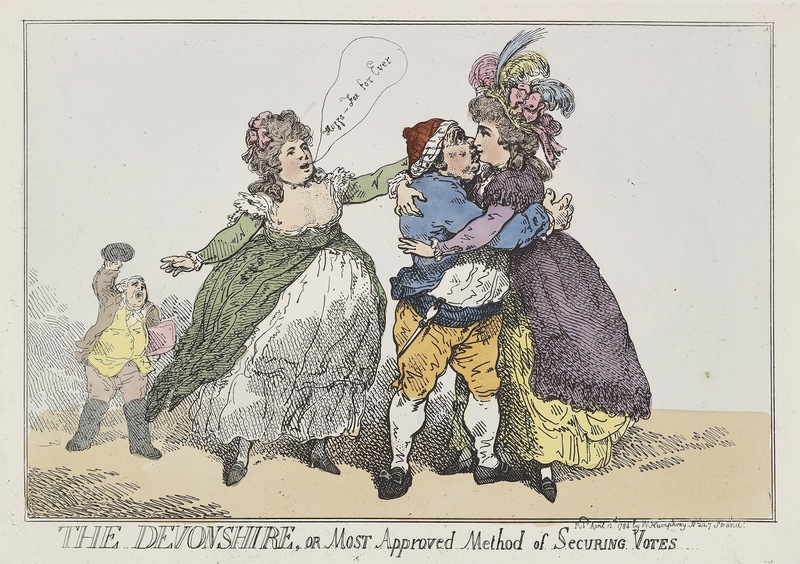 It is a lovely introduction to the subject of Thomas Rowlandson's art and caricatures in general. There is a comprehensive book that accompanies the exhibition which includes all the prints and pictures on display (and a few more besides) together with the background and provenance for each. I think it is excellent value at £9.95 and would highly recommend it. More details can be found on the Royal Collection website. Before I start telling you about the exhibition, I have a confession to make. I am not a huge fan of caricatures—they are very Georgian, but not always to my taste. 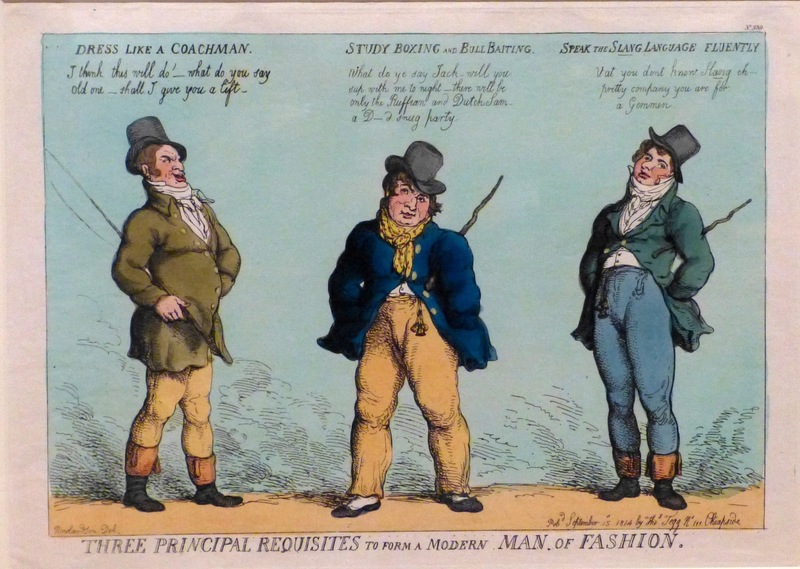 Rowlandson’s cartoons are often quite ugly and frequently bawdy. However, I appreciate their cleverness even when I’m not keen on the pictures and I did find some prints in the exhibition that I liked. 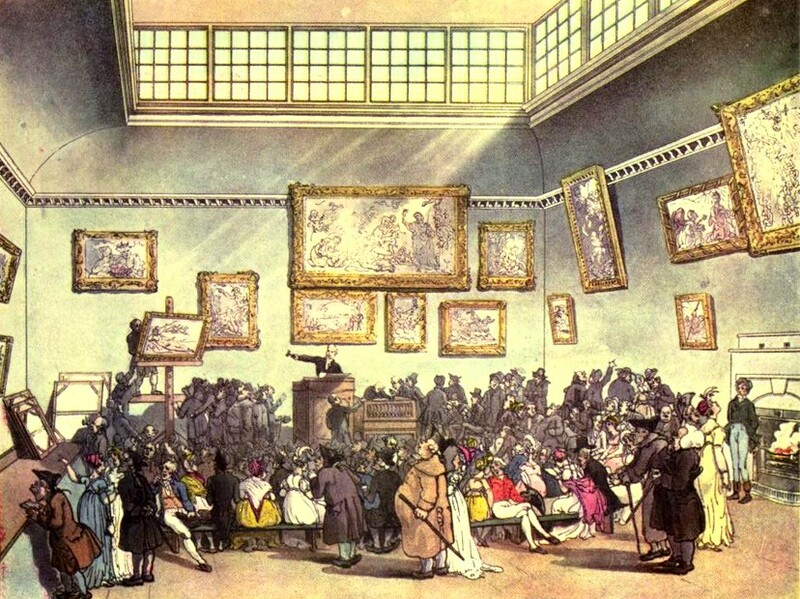 Caricatures were a great source of amusement to rich and poor alike. 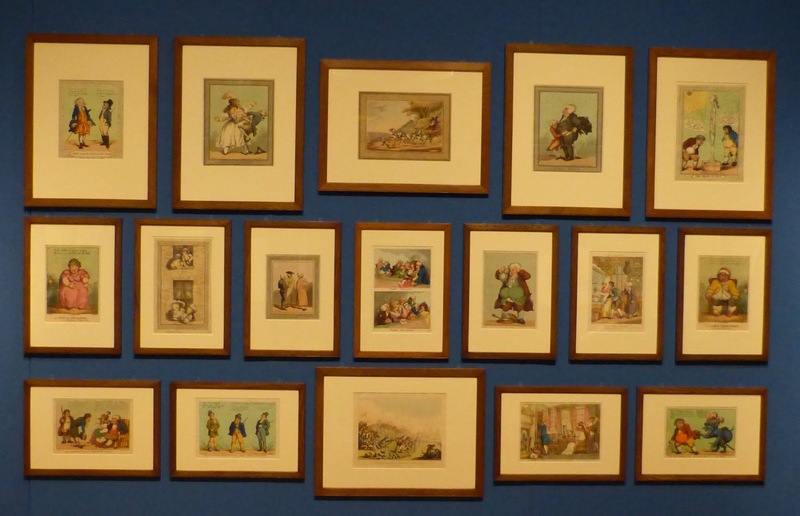 It was fashionable to collect prints and display them on a wall or screen or keep them in an album. 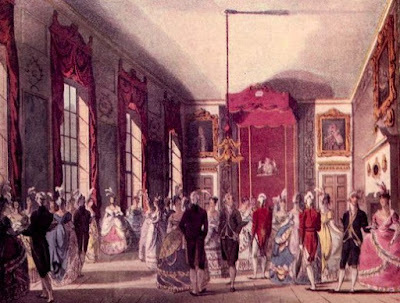 Showing off your print collection was a popular after dinner entertainment. If you couldn’t afford to build up your own portfolio, then you could hire one from a print shop for the evening to share with your guests. 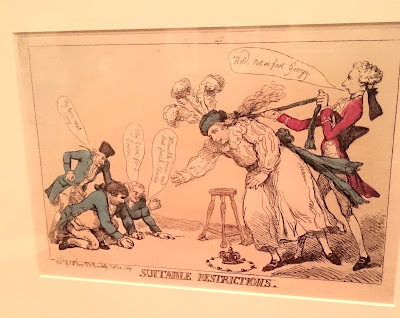 If that was beyond your means, you could still enjoy spotting the royals and politicians lampooned in cartoon form by gazing at the latest prints on display in the print shop window. 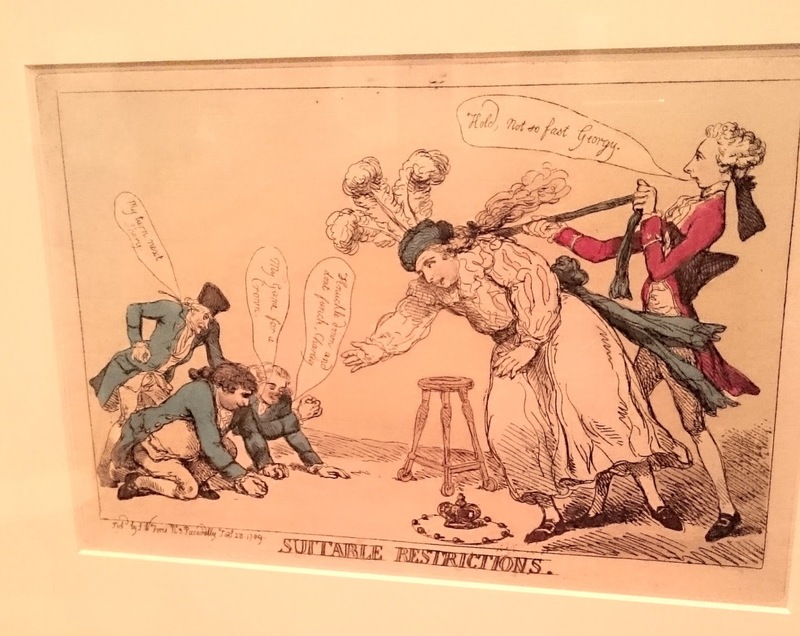 Many of Rowlandson’s prints were social satires – taking a humorous view of daily life and topics that were in the news. Rowlandson was fond of depicting opposites - such as Doctor Convex and Lady Concave at the top of the page and the very streamlined outline of Buck's Beauty contrasting with the curves of Rowlandson's Connoisseur below. 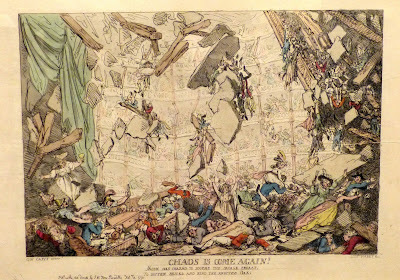 Rowlandson delighted in caricaturing current events, such as the news that Richard Brinsley Sheridan was going to pull down the Theatre Royal in Drury Lane in order to build a bigger one. Rowlandson depicted this as the theatre tumbling down during a performance. 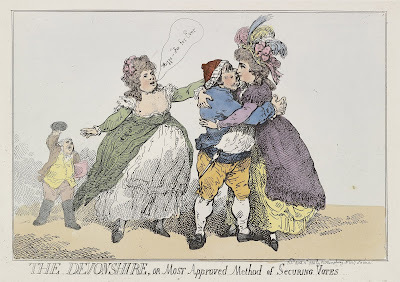 George III and his family were frequently the subject of Rowlandson’s cartoons. 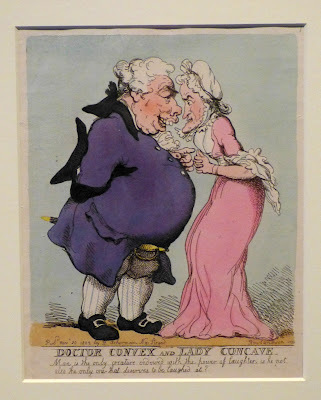 His caricatures included prints about George III's illness of 1788-9; George, Prince of Wales' bad behaviour; and the Mrs Clarke scandal of 1809 involving the Duke of York. During the Mrs Clarke scandal, Rowlandson produced an incredible 27 caricatures in little over 6 weeks! 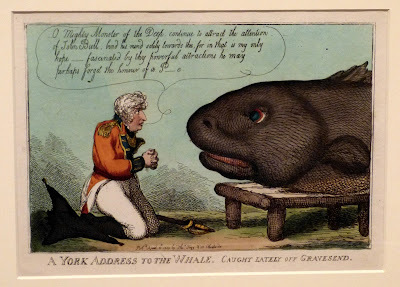 A York address to the Whale. Caught lately off Gravesend. Rowlandson began producing political caricatures around 1780. The battle between the Whigs led by Fox and the Tories led by Pitt gave ample scope for his wicked wit. 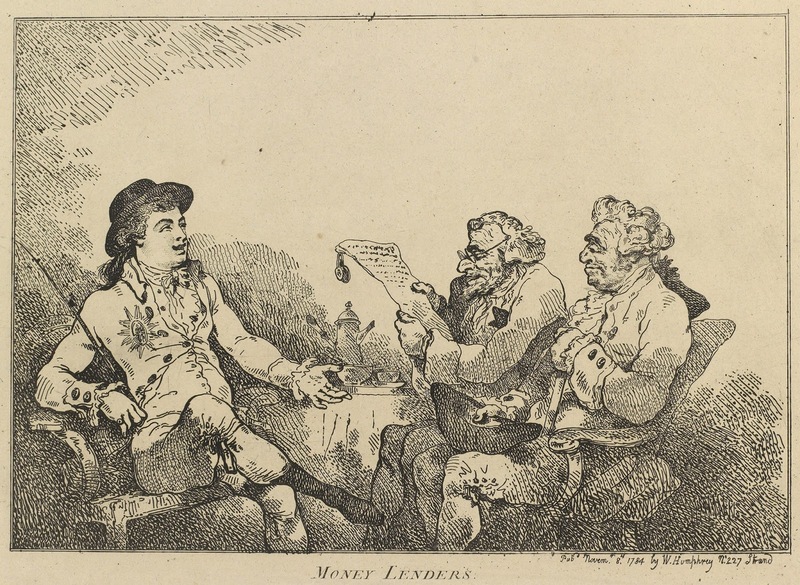 His series of prints on the Westminster Election of 1784, published by William Humphrey, was particularly successful, firmly establishing him as one of the leading satirists of his day. in order to secure his vote for Fox. In addition to all the caricatures, a number of Rowlandson's other works were on display. 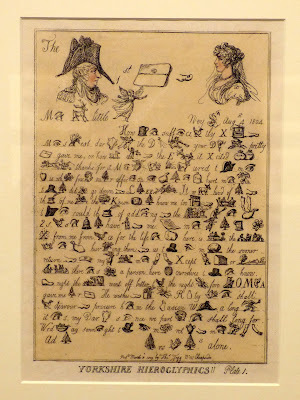 These included book illustrations from Ackermann’s Microcosm of London and An excursion to Brighthelmstone made in the year 1789. This volume included what was probably my favourite picture in the whole exhibition – that of the bathing machines at Brighton pictured below. Pugin [the architecture] and Thomas Rowlandson [the people]. 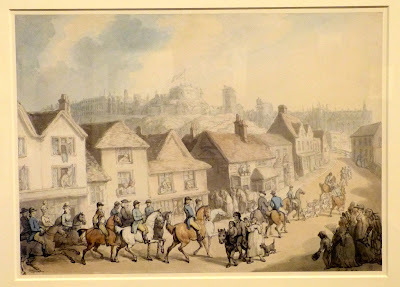 The paintings in the exhibition included this one, featuring George III returning from a hunting trip. 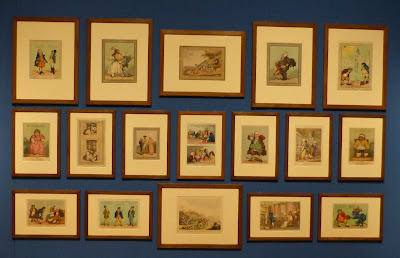 Having examined the Rowlandson exhibition thoroughly, we decided to take a quick look round the exhibition of Dutch paintings. 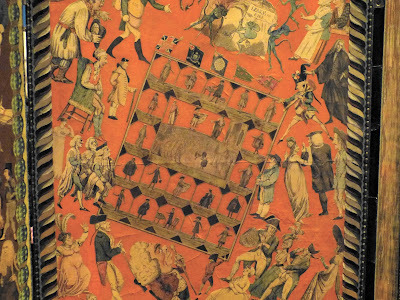 Although these were pre-Georgian, mostly dating from the 17th century, there was a Georgian connection. Many of the paintings were acquired by George IV and prints of various rooms in Carlton House and Windsor Castle from Pyne’s The History of the Royal Residences showed the paintings had been displayed. One or two of the paintings in the exhibition were even identifiable in the prints. from The History of the Royal Residences by WH Pyne (1819). 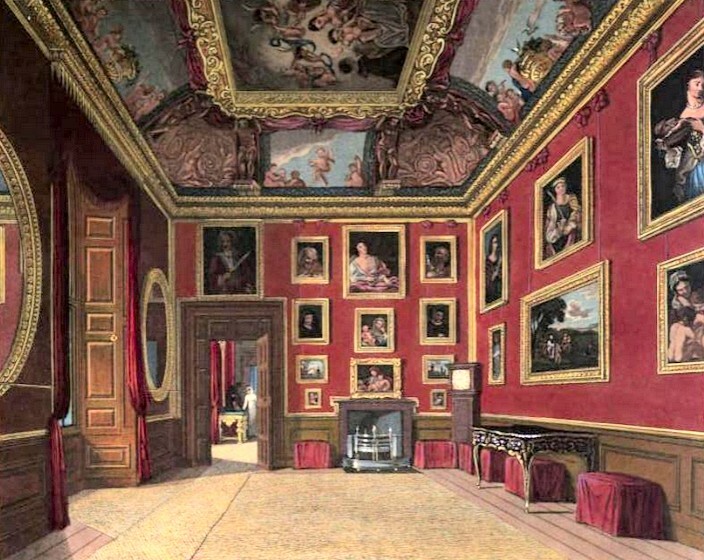 The Old Woman is on display to the right of the doorway. 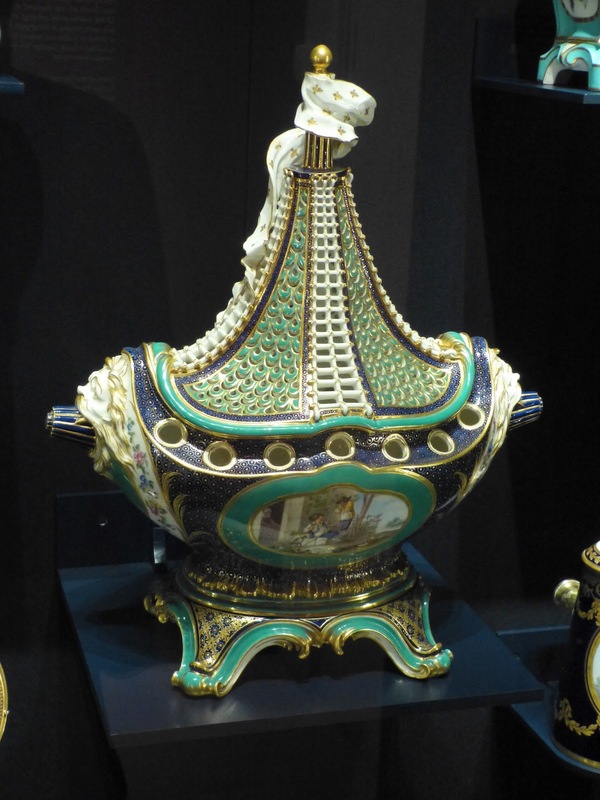 There was also a small selection of Sèvres porcelain on display. Acquired by George IV in 1815.
from the Sèvres porcelain factory (1758-9). mistress of King Louis XV of France. In summary, High Spirits is a great little exhibition and as an added bonus, entry to the Dutch paintings exhibition is included. 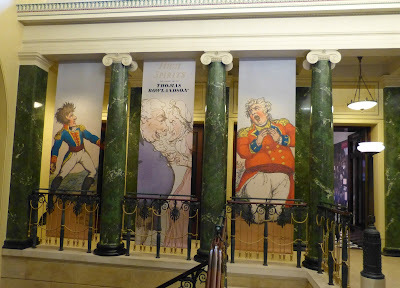 If you can't make it to London for the exhibition, the exhibition book details all the works of art on display. 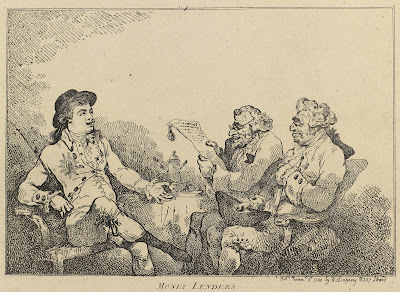 All photos © Regencyhistory.net except Money Lenders and The Devonshire © The Royal Collection. All prints and objects © HM Queen Elizabeth II. 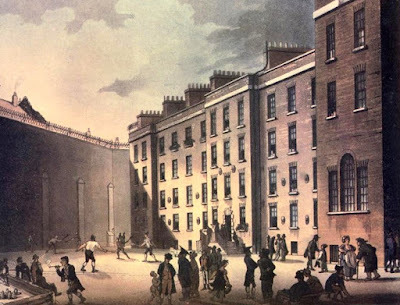 The Regency History blog is four years old! Can you believe that it is four years since I started this blog? I began in October 2011 and in the past four years I have posted 246 blogs and 16 pages and my blog is now visited by around 14,000 people every month. Thank you to all my readers – your support is what keeps me going. If you haven’t already done so, do sign up to my monthly newsletter which gives links to the previous month’s posts as well as extra bits of news about my writing and research. 2. When is the Regency era? 7. When was the London season? 14. Who was ‘Silly Billy’? 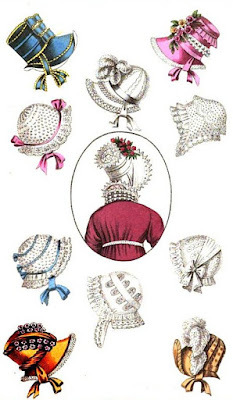 Two of my pages also rank highly – my lists of fashion links and Regency novels. Of course, posts that have been around longer have a higher chance of being ranked highly but, perhaps surprisingly, the list of my top twenty posts during the past year is virtually identical. When there is a spike of activity on my blog, I am always interested to know why. 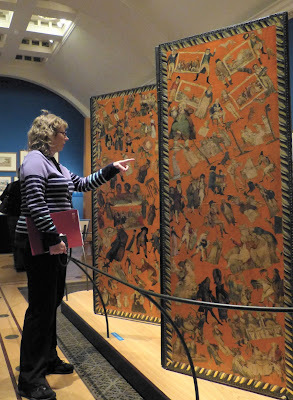 During 2015, I have had two days where I have witnessed unprecedented activity on my blog. Are you interested to know why? The first spike occurred on Monday 4 May when nearly 4000 people visited my blog in a single day. Why? Because the new Princess of Cambridge had just been named Charlotte and lots of people suddenly wanted to know about Queen Charlotte! The second spike was even more pronounced. It occurred on 8 August and over 7000 pages were viewed on my blog. Most of these occurred after 10pm and came from within the UK. Why? 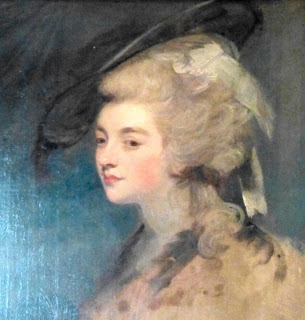 The BBC showed The Duchess starring Keira Knightley that evening and this sparked an interest in what the real Duchess of Devonshire was like!